Last Sunday the new Oak Grove Elementary School looked like this in the afternoon sunshine. If you want to follow the progress of the big construction projects in the Greater Albany Public Schools, a good place to look is the monthly report to the school board from HMK Company, the district’s project manager. 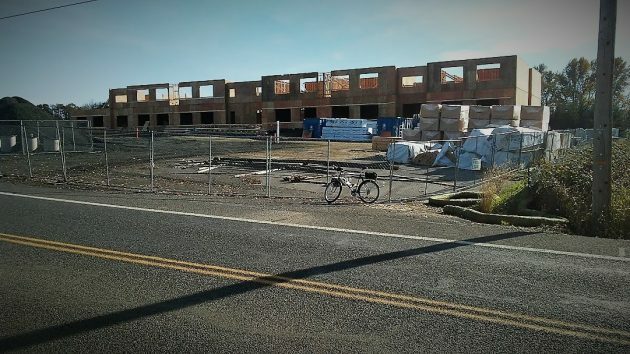 Riding past the construction site of Oak Grove Elementary last Sunday, I could not help noticing that the place is beginning to look like the images architects drew of the two-story school when it was being planned. The Oct. 28 report from HMK, based on the project status at the end of September, reflected steady progress according to schedule. The wood-frame walls had been prefabricated and were set in place with the help of a crane, and that work continues. According to the report, the 60,405-square-foot school, being built by Gerding Builders on a budget of $27.5 million, is scheduled for “owner occupancy” during the first three weeks of August 2019. The bigger school being built at the other end of town, the 90,000-square-foot Meadow Ridge, with a budget of more than $40 million, was reported to be 17 days behind schedule in mid-September. A subsequent report suggested it was falling further behind, and HMK said it was working with main contractor Todd Construction on a plan to catch up. You can find the latest monthly report from HMK with the latest school board agenda and minutes, available on the GAPS website here. Local spending by government “should be reassuring to the GAPS taxpayers who are paying the bill”? Only in a parochial, emotional sense. There is zero reassurance about any real economic benefit. In the real world government can’t inject money into the economy without first taking money out of the economy. Government putting money in the economy’s right pocket causes money to be taken out of its left pocket. Nothing is created, only redistributed with a layer of waste included. But if you’re a local taxpayer go ahead and feel better. Just don’t fool yourself about what has really happened economically. Gordon, fair points RE the economics, but are you also implying local government should get out of the business of building/operating schools? My comments weren’t intended to make that implication, but since you asked, here is what I advocate. It is long overdue for a pro-liberty approach that involves free-market education where choices are made not by government, but parents, students, and teachers. Education is a commodity that the private sector can easily provide. Our children are held back by one-size-fits all public education. There is a better way, if we have the guts to pursue it. The charter schools favored by the Republicans who want to do away with public education (it is no secret that that is what Republicans want) always have lower test scores from their students than the public schools. So, they aren’t exactly a “crashing” success. Although, their graduates may crash at some point in their future. I’m not a Republican so I don’t know what charter schools they favor. U.S. News & World Report says charter schools in Arizona topped the national rankings for the second year in a row. Clearly these non-traditional schools are a step in the right. But Charter schools are still public schools, just not as hamstrung by regulations that stifle traditional public schools. I wouldn’t be unhappy with vouchers as a positive change leading, ultimately, to “public” being taken out of the equation completely. Gordon, thank you for your thoughts. Since the principle duty of school is to serve as a baby sitting service so folks can go out and earn a living, it seems a rather inexpensive investment. And, if a few youngsters actually absorb a smattering of nearly any subject…well so much the better. Plus, having new schools allows for more jolly good school mascot-naming kerfuffles. Of course, it’s about redistribution. How much money do rich folk need? Too bad all the money being spent will not improve academic performance of our students. HH’s recent comment about lousy math test scores basically said the tests are too hard even though the types of questions are known in advance. Local admin/teachers do not agree with State Dept. of Education requirements so Taxpayers pay >$100 million per year while students do not excel. Nothing reassuring about that. muppets spoofs reality—not this time. Thank you for contributing to the inanity. I’m thinkin’ Knox Butte is the Nutria’s last stand as they are pushed mercilessly eastward, victims of human infatuation with itself. There is real economic value that public schools have. Just ask a realtor how often buyers look at what school zone a property is in. Because they are publicly-owned and serve the entire community. Buildings are used outside of business hours for meetings sports events (youth and adult). The grounds are open to public when school is not in session. I can run the track at a high school or my kids can use a school playground. Most of all, public schools serve everyone in our community, not just the one’s who can afford it.